This is now one of my new favorite places in Pittsburgh. 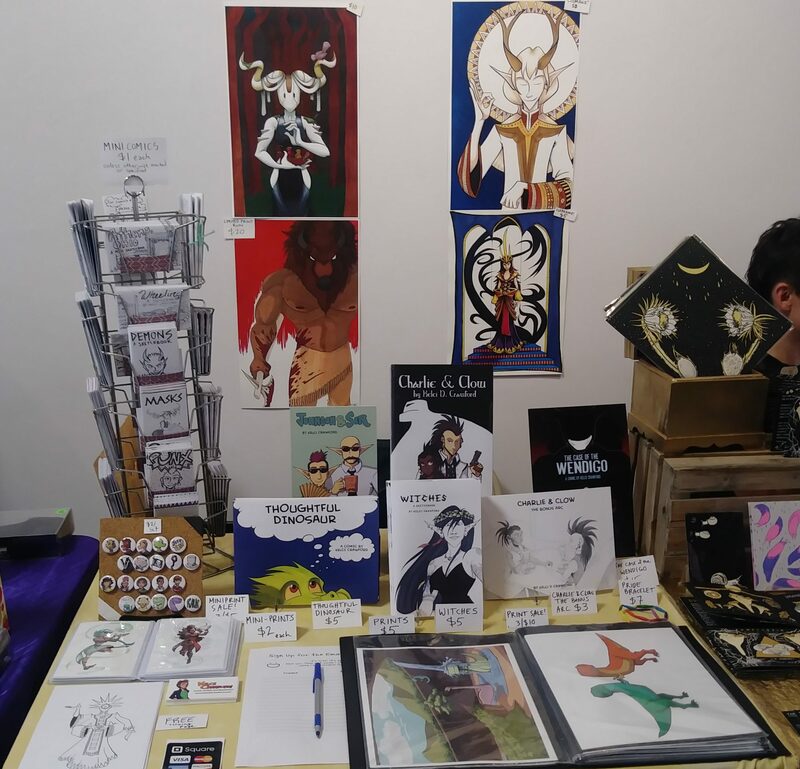 After I dropped off 3 copies each of Charlie & Clow, Johnson & Sir, The Case of the Wendigo, and Thoughtful Dinosaur, I got some minicomics, went downstairs to Kaibur, got an iced tea, and wrote some more for Dance Around the Maypole. 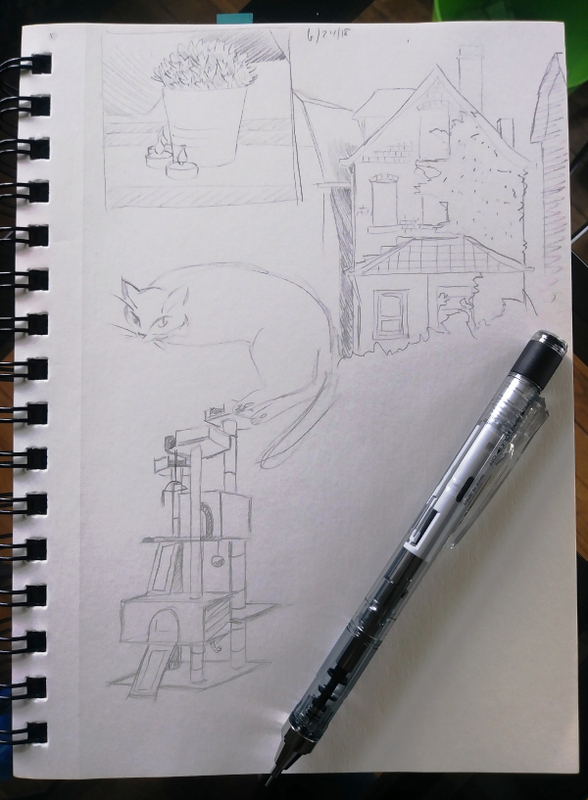 The script is still being worked on, but it’s 80% of the way to finished – for the rough draft, anyway. 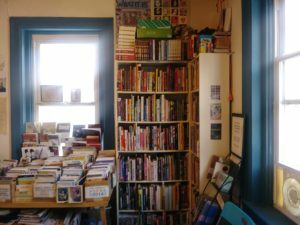 Then I hit the road again, to go up and down the ridiculously steep hills, around tight left turns, and all the way to The Big Idea Bookstore – my other new favorite location in the city. 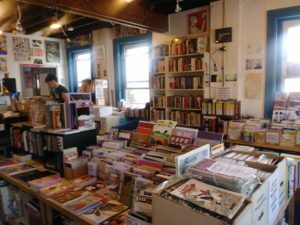 I didn’t get pictures of the inside of the place, but imagine a tightly-packed bookstore/coffeehouse filled with books on anarchy, feminism, anti-fascism, and fiction and poetry. 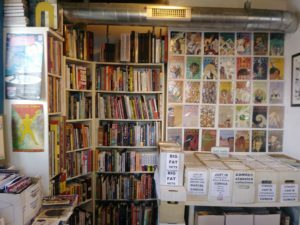 There was also a spinner rack full of zines about social activism, quarter-sized buttons on display on the counter, and a small bookcase covered in fliers, stickers, and promotional materials for everything from indie bands to protests to indie book labels. 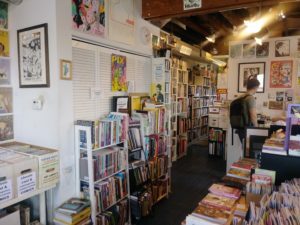 During the event, I shared what I knew about the underground comix scene in the 1970s up to the 2000s, the trends in zines in those decades, and how feminism influenced those trends. There was also a lot of tangents. I cannot give a talk without going into tangents. It runs in the family. 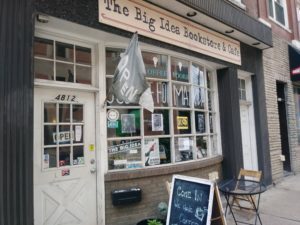 I ended up running a little late to the next event, the Feminist Zine Fest Pittsburgh Zine Reading, because the talk at Big Idea ran a little over the time limit. The zine reading was fun and intimate, because the crowd was small. After that I had vegan food with two ladies I met at the event, then crashed at the house of a friend of a friend of mine. The next day was Feminist Zine Fest itself. I managed to get the same spot I was in last year, next to the same table neighbor. We got a pretty sizeable crowd! 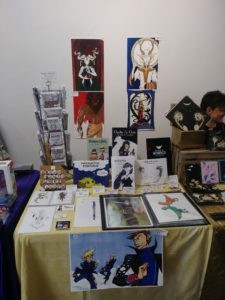 However, I ended up not making as much at this show compared to last year’s show. Part of that is because there weren’t a lot of kids there this year – kids love to check out my stuff, either because of the dinosaurs or because of the art style. Sometimes both. Sometimes neither. But I’m glad for the business that DID come my way. After that, I hit the road and went straight back home…as straight as I could, anyway, because there was a car accident I had to navigate around. I don’t have any other conventions lined up for a few weeks. There may be an appearance around July 22 for Not At Con Day at the New Dimension Comics in Saint Clairsville, OH, and possibly another one July 14 (depends on what my comics buddy Ben is doing)…but that would be it for a while. On the one hand, it’s a relief to be at home for a bit and not have to travel. It gives me time to restock some things, follow up on consignments with shops, and do some commissions. However, there’s been something happening outside of convention life that has me worried. 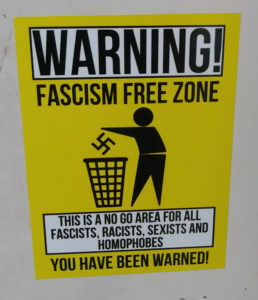 It concerns my working at the comic shop in town part-time. I’ll write about that in a separate post. The other thing, too, is that I’m not sure I want to take a break from travelling quite yet. I love travelling, and the amount of it that I’ve done just in the last 6 months hasn’t changed my mind about that. Yes, it’s good to be home for a bit to rest, but I feel pulled to hit the road again. We’ll see what happens over the next few weeks. Before I go, I want to give huge thank-yous to Ein and Aiden for letting me crash on their couch; to the Big Idea Bookstore for having me speak in their shop; to Bill at Copacetic for having my comics on consignment at his shop (and in general just being really cool); to the folks at Kaibur Coffee for the ambiance and the tea; to Mark and Chris for attending not just the Big Idea talk, but the zine fest the next day (you are both awesome! ); to Kimm and his kids (so sorry if I got your name wrong) for their enthusiasm and their support; to the ladies at Feminist Zine Fest Pittsburgh for having me and running such awesome events; to Caroline and Kelly for dinner; and the folks who checked out my work at the fest! Next PostNext How Did the Patreon Pledge Drive Do?